Become a Holy Helper . . .
. . . by making a monthly gift to the Center to guarantee its many services are readily available to those in need. Since 1978, our monthly donors have formed the backbone of our work, ensuring we are here for others into the future. 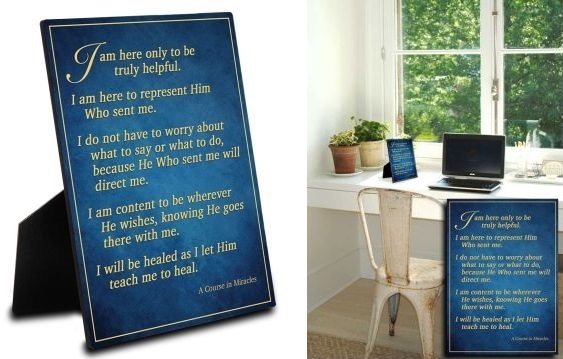 Now, when you become a new Holy Helper with an ongoing, monthly commitment of $15 or more, we will send you this Miracle Plaque, in high-gloss finish, 5 inches by 7 inches, mounted on wood with an easel. This plaque was exclusively designed and created by your Miracle Distribution Center family. Holy Helpers are also entitled to a 10% discount on purchases from our store. Your tax-deductible donation . . . Allows the Center to serve as a contact point for individuals and groups who might otherwise never have the opportunity to interact. Helps to maintain the free distribution of our publication, The Holy Encounter, with inspirational and educational articles based on A Course in Miracles. Ensures that weekly study group meetings can be presented free of charge at our Center. Allows us to live stream our weekly meetings to the world, at no charge. Keeps our international Course study group map up-to-date. Helps support our Prison Project. Keeps you informed of Course news, events, lectures, etc. around the world. Ensures that our staff is available to answer questions on Course concepts and applications. Provides funding to continue our Daily Lesson Email Service. Helps maintain this website which offers our free services to students worldwide. Supports the Miracle Prayer Ministry with a prayer time daily at 4:30 p.m. Pacific Time.